Plans have been approved for a £2.5m development to improve passenger facilities at Cornwall's struggling main airport. 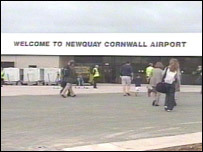 The scheme includes an extension to the terminal building at Newquay which will cater for 400,000 passengers a year. New arrivals like Ryanair and Air South West have seen passenger numbers soar from 80,000 a year in 2002 to 250,000. Yet the airport is still losing £1m a year, raising questions about whether landing fees should be raised. There is also uncertainty over the future of the Cornwall County Council-owned airport if the Ministry of Defence (MoD) decides to downsize or close RAF St Mawgan, whose site the airport shares. But Colin Jarvis of the county council, which gave the plans the go-ahead on Wednesday, said it was essential to support the airport which brings in about £17m to the county's economy every year. He said: "We are hopeful that the MoD work will be completed by the summer and that will be before we commit to the major construction elements of this project. "But I think if we look at the issue of Newquay airport, everyone is in agreement that it is vital that Cornwall maintains an airport for business and leisure use." Mike Coombes, commercial manager of Air South West, which flies between Newquay and Gatwick, rejected the notion that airlines should pay more to fly into Newquay. He said the airline was charged a "commercial rate" which it negotiated with the authorities at every airport it flew into. He said: "The key way to improve the financial situation of the airport is to get more passengers going through it. "We have to pay a charge for every passenger so if we can make better use of those facilities by getting more passengers through then that clearly helps the economic viability of the airport."